Not just another sticker, button or magnet! The Quantum Cell contains powerful technology for full cell phone radiation protection that has been tested for years. The Quantum Cell not only protects you from the radiation generated by your cell phone. If you carry your phone with the Quantum Cell on it wherever you go, you will be greatly protected from all other EMFs, as well. Why you need a Quantum Cell ? Although there is great controversy about whether cell phone radiation is hazardous for our health or not, there are now dozens of independent research studies that clearly conclude that cell phone radiation is extremely dangerous. Why take chances with your health, while waiting for researchers to come to a consensus? It’s especially important if you find yourself feeling irritable, fatigued, or fighting a headache after being on the phone for awhile. These are symptoms of cell phone radiation exposure–and they can lead to something much more serious. Lisa Tully, PhD, of the Energy Medicine Research Institute in Denver, CO conducted a study on the effect on the heart rate when using the Quantum Cell. 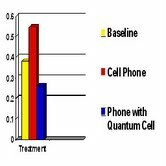 Cell phone Use with Quantum Cell———- 74 BPM — better than baseline! Bluetooth & Headsets: One Quantum Cell on your cell phone provides total cell phone radiation protection for any and all attachments on your phone. Cordless Phones: Cordless phones emit dangerous radiation as well. One Quantum Cell attached to the base of your cordless phone will protect anyone using any handset connected to that base. Click the button below to add the Quantum Cell to your wish list.